My Dad passed away one year ago today, making it fitting that today is Memorial Day. Since my father served in the Army from 1957 – 1959 as a Chaplain’s Assistant it is a great day to remember a wonderful guy. …and by the end of the year you have read through the Bible. You can start any day! Don’t think that this is a January to January thing. It is not. Anyone can do this. You can do this too. Start any day. Start today! If you do, one year from today you will have read through the entire Bible. Dad originally designed this so that he would no longer get bogged down and quit reading through the entire Bible in a calendar year when he reached Leviticus or Numbers. Nothing against those books but they are daunting in this devotional setting. This same problem is common with lots of folks, not just my Dad, who are trying to read through the Bible in a year using the “novel” or “cover to cover” Bible reading method of starting in Genesis 1:1 and reading every day straight through to the end of Revelations. I know personally, that I have never made it past Psalms with the “novel” approach. 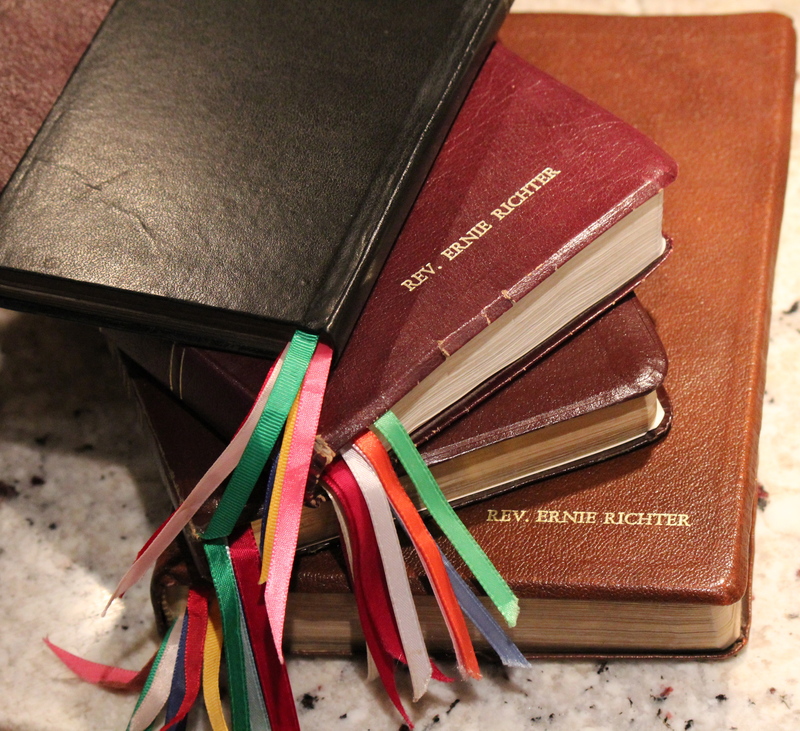 Dad wanted to use his own Bible and not purchase another one made specifically for this “in a year” purpose, so he got some Elmer’s Glue and 7 differently colored ribbons similar to the one ribbon book marker that came with his Bible. 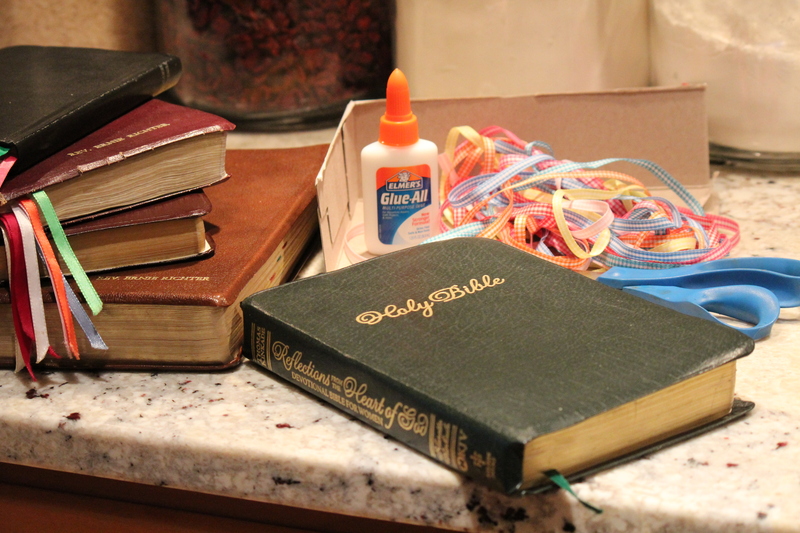 He glued the additional ribbons to a piece of old manilla file folder that he cut to fit down into the spine of his Bible and then he wrote his “Reading Program” into the inside front cover of his Bible. 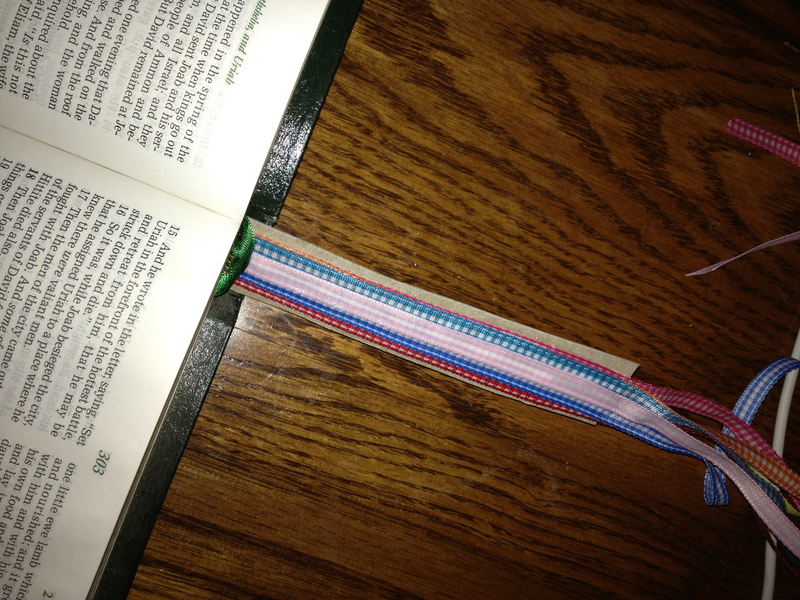 Every day thereafter he read a page at each of the ribbon markers and, by the time he passed away last year, he had read through the Bible in year at least 4 or 5 times, maybe even more, before his illness made reading too difficult. 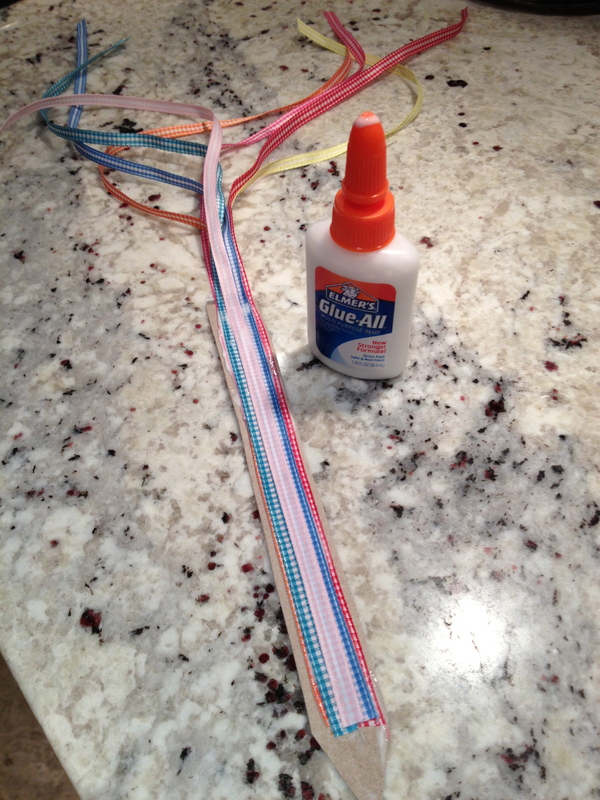 Years ago He offered to put ribbons in my Bible for me, but I declined. I hate to admit it, but I declined because I didn’t like the ribbons he had. 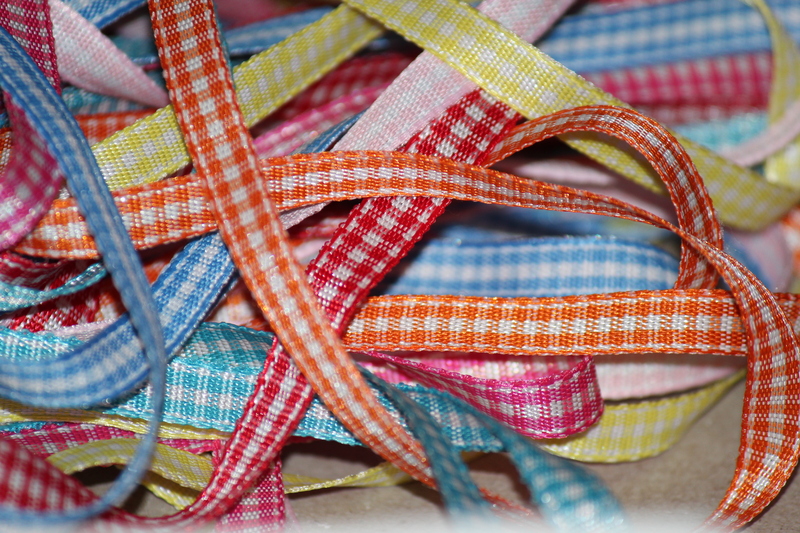 Anyway, yesterday, I went to the fabric store and found 7 ribbons that I do like. 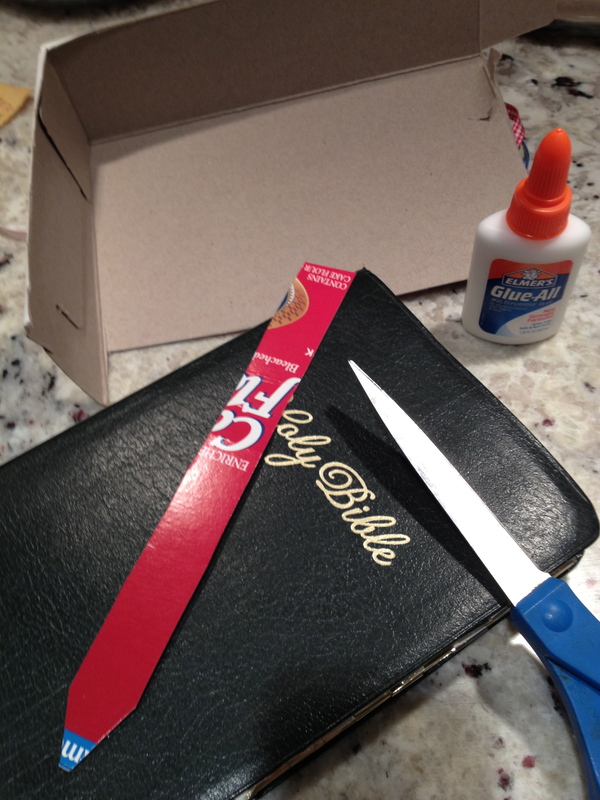 I bought some Elmer’s Glue-All, I cut up a box of Swan’s Down Cake Flour destined for the recycle bin and I added them “Ernie-style” to my personal Bible, in order to show others how to “Read through the Bible in a Year The Ernie Way. Also, in order for me to be able to read through the Bible in the coming year just like my Dad. It is the most fitting memorial to my Father that I can think of. 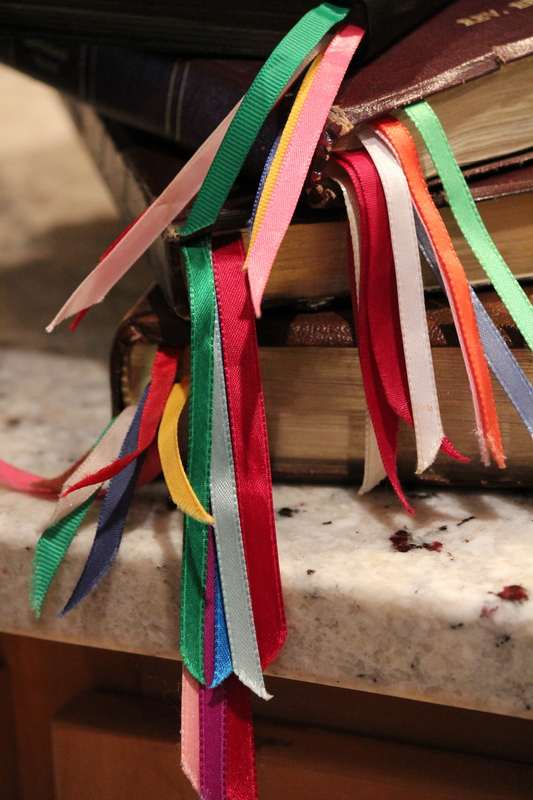 Let me know if you add ribbons to your Bible and how it goes. this is a wonderful plan, so simple. 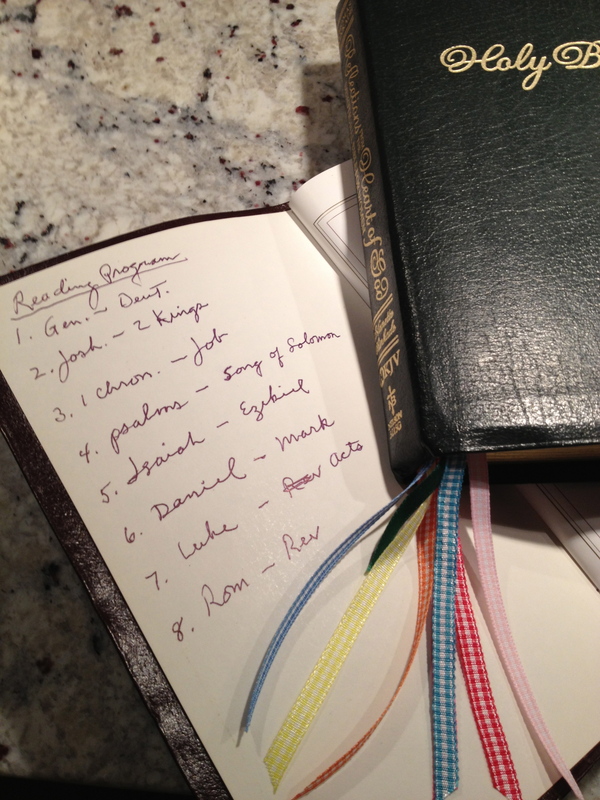 I have tried all the complicated ways to read thru my bible, including the novel approach, and never made it. Today is January 1 and as I was saying my morning prayers I was inspired to try again and so I went to Pinterest for inspiration and there was your posting! I am starting today!! I don’t have ribbons, but I have yarn. Thank you so much for sharing! Karen, a correction on my part. 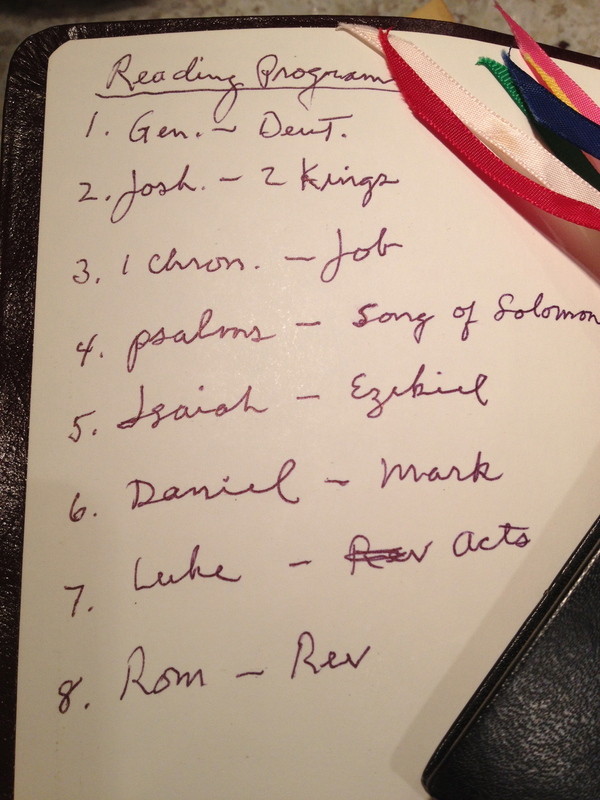 I do realize you wrote “Dad’s read-thru-the-Bible-in-a-Year-Program” not entire Bible. Lesley, If you choose to read a chapter or a “page” (depending on your bible) at each of the 8 markers every day you will have read 2,920 pages or as many chapters depending on how you work this program in a year. According to DeafMissons.com there are a TOTAL of 1189 chapters in the old and new testaments. I just looked and there are 1228 pages in my Bible. So you can easily read the entire Bible and then some in a year if you wish. Thanks, for the info and I’ll give it a try. Headed upstairs to choose some ribbons from my collection. Yay! Looking forward to seeing what you come up with! This is a fabulous idea and a truly wonderful tribute to your father and the Father. I’m going to give it a go as I have never read the entire Bible. I have some modern versions and many very old Bibles from my family. Thanks for sharing Karen. Katy-did! I somehow knew you would!